Receive one month free membership to our Listen Members ONLY 1! All you need to do is fill out our QUESTIONNAIRE!!! Your feedback will help us to better serve you and thank you for your input. We have something for everyone! Visit our Shop Pages and contact us if you have questions or are looking for something specific you don't see. Not everything is on this site and custom orders are an option as well. We are capable of making many things! Would you like to become a MEMBER and get special access to MORE songs, special discounts and events? Go to our MEMBERSHIP page for more information! Join me in retreats and ceremonies all over the world. Follow the link below to view past occasions or to see what's up next. Can't wait to connect with you! A journey in song, prayer, and family! Email us for more information. 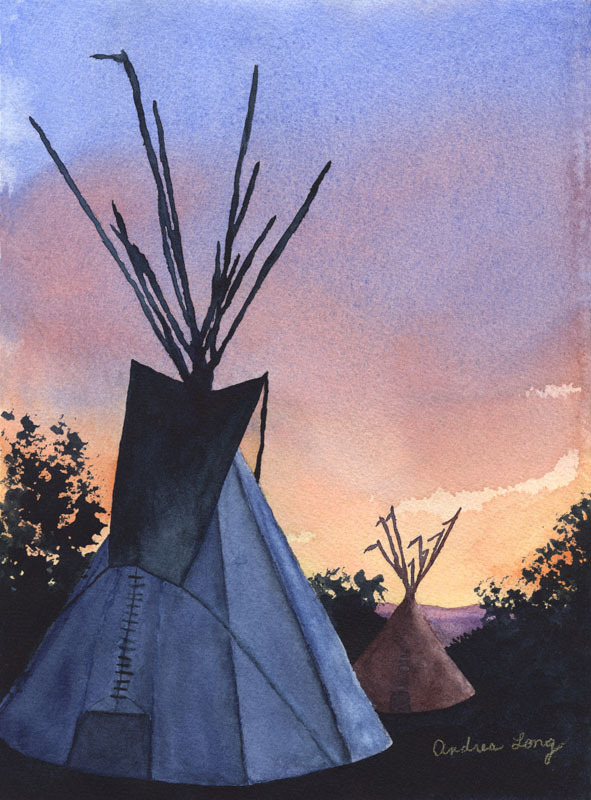 Join the Singing Stone family for our annual Vision Quest in Crestone, Colorado. Email us for more information. Through all night prayer, song, and clear presence, we set forth our own personal intentions while supporting the main intention and reason that we are gathered. Set around a sacred fire, we sit up from dusk until dawn, cleansing, blessing, and renewing our Spirits as we are birthed into a new day. All Ceremonies and events are by donation. Space is limited so if you're feeling called to attend please contact us soon. Buffalo Goddess Society remembers and honors the sacred buffalo nation who once roamed ALL of Mother Earth. 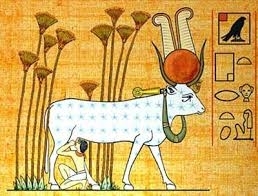 The most widespread cult of the ancient world surrounded Goddess worship which was accompanied by the Bull. This symbol represents the entire range of humanity and is the ultimate power of the Goddess. All of life comes from the divine womb of our mother. Strikingly similar to each other, the Fallopian tubes and the horns of the Bull are a direct representation of the union between feminine and masculine. We celebrate sacred worship of our buffalo relatives through various traditions around the globe. She is the Crescent Horned Moon Goddess: Inanna, Hathor, Hera, Astarte, Luna, White Buffalo Calf Woman, to name a few. 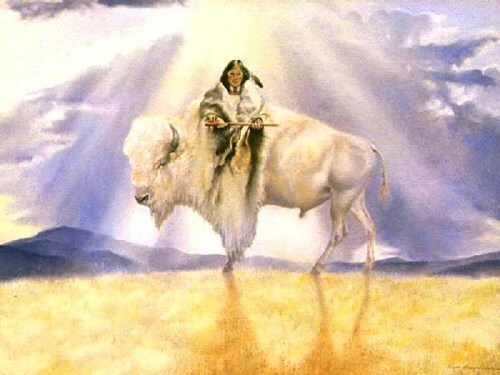 One of the most important stories in Native American mythology is that of the White Buffalo Calf Woman. Whope, Falling Star appeared to Earth from the West and transformed into Pte San Win. The Chanupa, Sacred Pipe was brought to the people for peace between people and nations. The White Buffalo Calf Woman intervenes in our lives when there is hardship. She and the bufffalo are one, an equation between nourishment and reproduction. Tatanka Sicun, Buffalo Spirit represents the energy of life as food and shelter for the people. Humans are being called to speak to the Buffalo Nation by way of song and prayer. Many people associate the buffalo with Native American cultures when in fact forms of buffalo may have roamed the entire earth. They are intricately connected to the existence of the human species. The Cave of Altamira located near the historic town Santillana del Mar in Cantabria, Spain is renowned for its Paleolithic cave paintings. The earliest paintings in the cave were executed around 35,600 years ago. Prehistoric depictions and sacred Temples of the Goddess honoring the sacred buffalo have been uncovered in many countries of Europe. Did you know that the term buffalo was created in the language from the not to distant past? True buffalos are different animals that live in Asia and Africa. American bison, on the other hand, live only in North America. Early American settlers probably called bison “bufello" because French fur trappers called these huge animals boeufs due to their similarity to oxen. Presently forms of our beautiful relative exist in Africa, Australia, Asia, North America, and Europe. Buffalo Goddess was created through a culmination of visions and teachings received under the Divine Feminine altars of North America. We believe this is our chance to consciously and effectively intervene in our own cultural evolution. By bringing back the Goddess consciousness, we as a people are awakening our primordial memories. Merging the physical and spiritual as well as the masculine and feminine, we honor the sacred Crescent Moon Horned Goddess. Now is the time to intend this rebirth of the Great Goddess in all of her aspects. We embrace each man and woman through creative expressions flowing forth from Spirit as they did through our ancestors. In light and darkness, beneath the surface of our domesticated world, primitive instincts and the symbolic mind spring forth. The Goddess is remembered and honored while we witness the rebirth of a balanced new era. To make a donation via a major credit card use the DONATE button below. If you'd rather use PAYPAL, there is a button at the bottom of every page. THANK YOU! At an early age Andrea showed an interest in the balance and flow of colors and overall feeling of any given subject. Spending numerous hours playing in the woods of her rural Michigan home, it was natural for her to commune with Spirit through the elements that surrounded her. She enjoyed the freedom of sharing her creative talents from within. Before leaving home Andrea assisted her mother in running a women’s wearable art store. After years of taking on the responsibility of store displays, she decided to go to college to pursue her interests in the field of fashion. She graduated from Ray College of Design in Chicago with a Bachelor of Arts degree majoring in Fashion Marketing and Management with a minor in Visual Merchandising. The years to follow were spent searching for a deeper understanding and connection beyond the material world. This self-exploration of the different realms led her to Crestone, Colorado where she would eventually create her new life. Andrea completed her Certification in massage and other healing modalities from the Crestone Healing Arts Center. Shortly after Andrea met her husband, Christopher Long, who would introduce her to new possibilities through the Native American path. As a stay at home mother of two in the pristine mountains of Colorado, Andrea had the space to re-explore her creative roots while growing her connection to the Great Mystery. Founders of The Singing Stone, Christopher and Andrea Long now assist others in experiencing life changing Indigenous Ceremonies. Instruction painting in watercolor was received from Andrea’s mother who is a successful artist. Her passion for the arts has become a joyful spiritual expression. Invoking the Goddess in her many aspects, there is a stream of Spirit manifesting through painting, singing and dancing. This heartfelt outpouring of the seen and unseen world is captured through these various mediums. Andrea’s dedication to the Divine Feminine has become her life’s purpose. Like what you see? 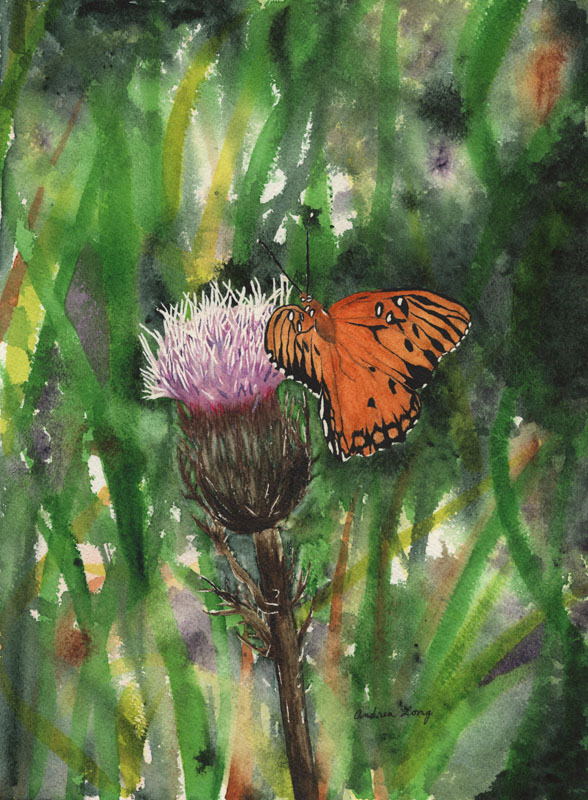 Visit my SHOP to purchase cards, prints, and framed originals of my artwork. Images in slideshow are available. Andrea Long is one of the founders of The Singing Stone, an organization existing for the improvement of the quality of life and spiritual well being of all who are willing to embrace the Ancient Aboriginal Culture of The Americas. This is done through song. Buffalo Goddess and The Singing Stone were ordained under the guidance of Sacred Fire of Itzachilatlan. Their teacher and chief, AURELIO DÍAZ TEKPANKALLI - is a Native Purepecha of Michoacan, México. Chief Aurelio lived in the United States as a young man with his parents, painting and building his career as a renowned artist working with themes related to indigenous people and politics. Most of his work is in Chicago and México City, but his murals also appear in National Geographic and other American magazines. Inspired and trained by his grandfather Purepecha, in search of knowing his ancestors, he has lived on various indigenous reservations, participating in rituals with his elders, and being initiated into various tribes and native nations, he is working to expand the “native recognition” beyond the frontiers of indigenous communities. Yay! You've found my super boring technical jargon section. Read carefully and do enjoy. By accessing www.buffalogoddess.com , you are agreeing to be bound by these web site Terms and Conditions of Use, all applicable laws and regulations, and agree that you are responsible for compliance with any applicable local laws. If you do not agree with any of these terms, you are prohibited from using or accessing this site. Permission is granted to download a copy of the materials (information PDFs or audio files) on Buffalo Goddess's web site for personal, non-commercial use only. The information and merchandise on Buffalo Goddess's web site are provided "as is". Buffalo Goddess makes no warranties, expressed or implied, and hereby disclaims and negates all other warranties, including without limitation, implied warranties or conditions of merchant ability, fitness for a particular purpose, or non-infringement of intellectual property or other violation of rights. Further, Buffalo Goddess does not warrant or make any representations concerning the accuracy, likely results, or reliability of the use of the materials or information on its web site ( www.buffalogoddess.com) or otherwise relating to such materials or information or on any sites linked to this site. In no event shall Buffalo Goddess or its suppliers be liable for any damages arising out of the use or inability to use the materials or information on Buffalo Goddess's web site, even if Buffalo Goddess or a Buffalo Goddess authorized representative has been notified orally or in writing of the possibility of such damage. Because some jurisdictions do not allow limitations on implied warranties, or limitations of liability for consequential or incidental damages, these limitations may not apply to you. YOU SPECIFICALLY ACKNOWLEDGE AND AGREE THAT BUFFALO GODDESS IS NOT LIABLE FOR ANY DEFAMATORY, OFFENSIVE OR ILLEGAL CONDUCT OF ANY USER. IF YOU ARE DISSATISFIED WITH THE SITE, ANY MATERIALS, PRODUCTS, OR SERVICES ON THE SITE, OR WITH ANY OF THE SITE’S TERMS AND CONDITIONS, YOUR SOLE AND EXCLUSIVE REMEDY IS TO DISCONTINUE USING THE SITE AND THE PRODUCTS, SERVICES AND/OR MATERIALS. The materials appearing on Buffalo Goddess's web site could include technical, typographical, or photographic errors. Buffalo Goddess does not warrant that any of the materials on its web site are accurate, complete, or current, though Buffalo Goddess makes every attempt that all information is. Buffalo Goddess may make changes to the materials contained on its web site at any time without notice. Buffalo Goddess does not, however, make any commitment to update the materials. Buffalo Goddess has not reviewed all of the sites linked to its Internet web site and is not responsible for the contents of any such linked site. The inclusion of any link does not imply endorsement by Buffalo Goddess of the site. Use of any such linked web site is at the user's own risk. Any claim relating to Buffalo Goddess's web site shall be governed by the laws of the State of Colorado without regard to its conflict of law provisions. Before or at the time of collecting personal information, we will identify the purposes for which information is being collected, including, but not limited to email list, newsletter, shipping, waivers, ceremonies and retreats. We keep NO credit card or financial information and use protected providers (via Squarespace) to process your transactions. We do NOT give any of your information to third-parties.